Twenty-five years on from being crowned World Champion in Karts, Gabriele Tarquini has at last added the WTCC title to his British and European crowns. With over 55 race wins across eight different touring car championships since 1989, the Italian has assured his place in the pantheon of touring car greats. 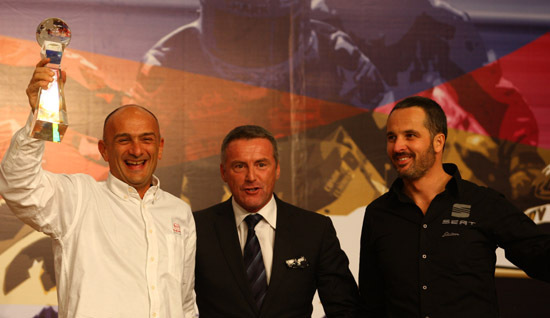 The World Touring Car Championship title establishes 47-year-old Tarquini in the FIA history book for two reasons; he succeeds Juan Manuel Fangio as the oldest ever FIA World Champion, while he becomes the first Italian to win a FIA World Championship since Teo Fabi in the 1991 World Sportscars Championship. In fact Tarquini is just the eighth Italian to win an FIA World Championship, following in the footsteps Fabi and Mauro Baldi (sportscars), Nino Farina and Alberto Ascari (F1), Sandro Munari and Miki Biasion (rallying) and Roberto Ravaglia. During his time in Grand Prix, the man from Giulianova in Abruzzo also infamously wrote his name in the F1 history books, with a record that is likely to stand the test of time. With 25 failed attempts to Pre-Qualify, and a further 15 failed qualifying sessions, Tarquini holds the record for the most unsuccessful attempts to qualify for a Grand Prix. After winning European and Italian karting titles in 1983, Tarquini attended a racing school at Vallelunga outside Rome, bringing about a car debut in the Italian Formula 3 series. His debut season saw him using March and Dallara chassis’ powered by Toyota engines before 1984 brought about his first taste of Alfa Romeo power, a marque with whom he’d become inextricably linked for much of his career. ’84 saw Tarquini adding a further Italian and a World karting title before continuing his rise up the single-seater ladder joining the newly created European F3000 Championship in 1985. One podium and sixth place in the championship was the story of his season in the Sanremo Racing March – Cosworth, while he picked up fifth place at the European F3 Cup behind winner Alex Caffi. The year also saw two first for Tarquini; his F1 debut at a Paul Ricard test for the Benetton team and his premier, and so far only, visit to Le Mans as teammate to Oscar Larrauri and Massimo Sigala in a Brun Motorsport Porsche 956, though the car retired after 323 laps. 1986 saw Tarquini reunited with Coloni in F3000 but again there was just one podium before a switch to FIRST Racing for 1987 saw take a second and fastest lap at Imola and a third at Enna to round out his F3000 career on a high. Tarquini made his Formula One debut at the 1987 San Marino Grand Prix, qualifying his Osella – Alfa Romeo at the back of the grid before retiring after 26 laps with gearbox problems. Gabriele would have to wait almost an entire year before his next chance to finish a Grand Prix, with Coloni entrusting their new Cosworth powered FC188 to him for their first full season of F1. After retiring from the first three races of the season Tarquini finished eighth in Canada, scoring what would be Coloni’s best ever Formula One result. For 1989 he was to be reunited with FIRST Racing, although when the chassis failed an FIA crash test before the Brazilian Grand Prix, Tarquini’s season looked to be over before it had started. When AGS’ Phillipe Streif was paralysed in a testing accident at Rio de Janeiro, Tarquini was called upon to replace him, putting in excellent performances to run in the point’s positions at Monaco and Phoenix before agonisingly retiring. At the 1989 Mexican Grand Prix the car lasted out and Tarquini came home sixth to score his one and only World Championship point in Formula One. For the second part of the season AGS were demoted to Pre-Qualifying, and so began the start of Tarquini’s record, with 14 consecutive failed attempts to make it through to qualifying. A fruitless 1990 saw just one finish (13th in Hungary) alongside a litany of DNPQ, DNQ and Retirements when he did make it onto the grid. By 1991 AGS were on their last legs, and Tarquini’s eighth place at the season opening United States Grand Prix was the last ever Grand Prix finish for the team, who failed to see out the season, with Tarquini ending up with the Fondmetal team. In a fragile Fondmetal Tarquini posted eight retirements from the opening eight races in 1992 with the only highlights being a, solitary, 14th place finish in Britain and an excellent 11th in qualifying for the Belgian Grand Prix. With terrible results and a worldwide recession, Fondmetal closed their doors at the seasons end and Tarquini’s F1 career was all but over. In a way unthinkable today, Tarquini had been combining his F1 attempts with a variety of touring car outings, sharing a Brixia Motorsport Alfa 75 in the 1987 WTCC to little reward, and a BMW M3 in the Italian Touring Car Championship in 1989 and 1992. With no Grand Prix drive in ’93, Tarquini returned to the ITCC finishing third and taking five victories in an Alfa Romeo 155, the model that would shoot him to fame a year later after he was surprisingly overlooked for a works DTM drive. Equipped with a homologation special Alfa Corse sent Tarquini and Giampiero Simoni to the UK, where Tarquini would win the first five rounds causing a raft of controversy over the 155’s aerodynamic aids. It all came to a head at Oulton Park, with Alfa leaving the circuit in protest at being told to remove their wings and spoilers. 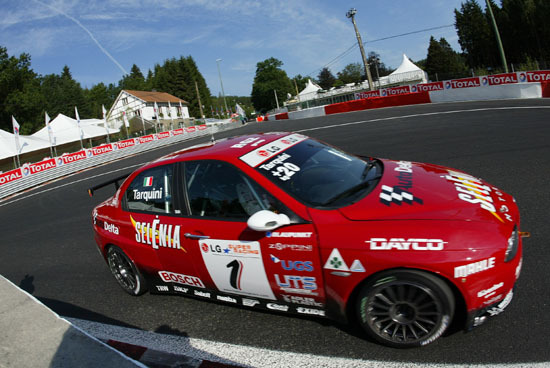 After a compromise was reached the Italian company returned for the next round and despite the lost points, Tarquini remained on course for his maiden touring car title. Second place in race one of the penultimate meeting of the year at Silverstone was enough to hand him the title thanks to his consistent podium finishes. Tarquini only once finished off the rostrum all season in the final race of the year, and had it not been for the missed Oulton race, three Did Not Starts and two retirements, his winning margin over Alain Menu would have been much higher. Of course one of those retirements (and a subsequent DNS) came at Knockhill, when Tarquini’s Alfa Romeo was launched into a series of memorable, but frightening, barrel rolls at McIntyre’s after contact from Tim Harvey behind. To many BTCC fans to this day, uttering the words Tarquini or Alfa Romeo brings about memories of this and a two-wheel moment at Donington Park before mention of his 12 wins in the series! 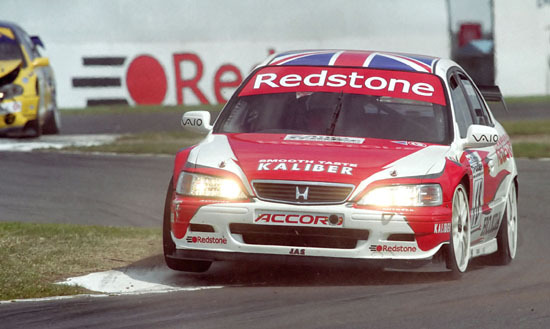 Having won a round of the Spanish Touring Car Championship in 1994, Tarquini spent ’95 adding to his Air Miles by competing in four different tin top series, and returning to Formula One, becoming only the second reigning BTCC champion to appear in a Grand Prix! 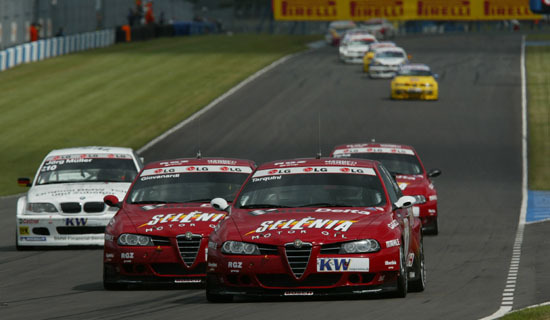 Seventh place and two wins in his domestic championship was added to appearances in a Schübel Engineering run Alfa Romeo 155 V6 TI in both the DTM and the inaugural FIA International Touring Car Series, plus a recall to the BTCC. Tarquini stood in for Derek Warwick at the Silverstone round mid-season, before being drafted in to replace Simoni, though with the 155 not enjoying its previous aerodynamic advantage even the reigning champion couldn’t haul it onto the top step of the podium. The Formula One call up came courtesy of Ukyo Katayama being forced to sit out the European Grand Prix on the advice of doctors following his barrel roll the week before at Estoril. Tarquini, who had been test driver for Tyrrell all season, brought the Yamaha powered machine home in 14th position, bringing down the curtain on his F1 career after 78 Grand Prix. 1996 saw Tarquini in victorious form on British tarmac again, winning race two of the Silverstone round of the ITC, his sole win of a campaign in which he ended 14th in the standings in his Martini liveried, second division, 4WD Alfa Romeo. 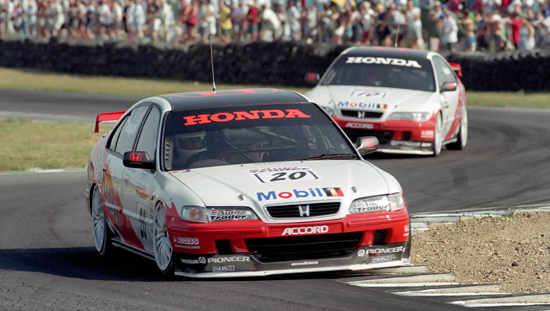 The demise of the ITC and a switch to Honda for 1997 saw Tarquini back in the BTCC as teammate to James Thompson in a Prodrive run Accord. A win at Thruxton and sixth in the standings, just two points behind his younger partner was added to a win in an Accord in the Belgian Procar series. Sticking with Honda in ’98, Tarquini switched to the German STW with the JAS team alongside Tom Kristensen taking a solitary win on the temporary airfield circuit at Lahr. Seventh in the STW saw Tarquini finish well ahead of his Danish teammate, but a year later the positions were reversed, with Kristensen outscoring him three wins to one, with the duo finishing third and fourth in the championship. Fittingly for a man who had driven the machine that ushered in the splitter and wings era of Super Touring, Tarquini returned to the UK for the final season of those regulations in the BTCC, after a couple of guest appearances in ’99. Partnering Thompson and Kristensen, Tarquini finished up as the lead Honda driver, but down in sixth place, despite wins at Knockhill, Oulton Park and Donington, thanks to the Ford steamroller. Towards the end of 2000 Tarquini had some run outs in the forerunner to the European and World series, the European Super Touring Cup, showing the direction his career would develop during the ‘00s. Despite taking nine wins in 2001 Tarquini could only finish third behind champion Fabrizio Giovanardi, while the switch to S2000 rules at the year’s end saw Honda depart and the Italian without a drive. It wasn’t until an outing in an Alfa Giulietta at the Goodwood Revival that the Abruzzo native had a competitive drive in 2002. As Giovanardi and Nicola Larini battled with the BMWs for the title, Tarquini was drafted in to bolster their challenge at Donington, but, after a third in race one, the weekend ended in controversy with Tarquini earning himself a 25 second penalty for punting championship contender Dirk Muller out of the second event. 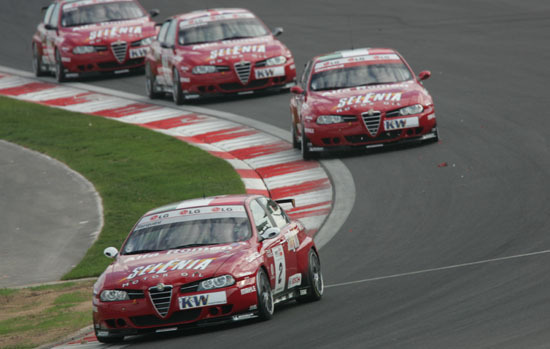 A year on and Tarquini was the contender having been given a full time Alfa Romeo drive with the works Autodelta team. Six wins gave Tarquini his first title since his British success, but it was a close run thing. A brace of wins at the penultimate meeting at Estoril sent Tarquini into the final round of the year level on points with Jorg Muller. A puncture in race one harmed the German’s chances meaning the Alfa driver could afford to finish third behind Muller in race two and still take the title by a point. The defence of his title saw Tarquini again take six wins but only finish up third overall after transmission failure at Oscherleben ruled him out of both races at the penultimate meeting. 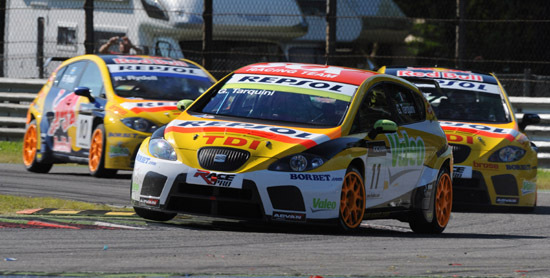 2005 was the dawn of a new era in touring car racing with the re-birth of the World Touring Car Championship, ironically with Tarquini having competed in the sole previous edition 18 years before. Tarquini continued his excellent form in front of his legions of British supporters to win at Silverstone in May before adding a second victory at Istanbul later in the year. This would be, for the present, Tarquini’s last touring car win for Alfa Romeo, an association stretching right back to the beginning of his career. 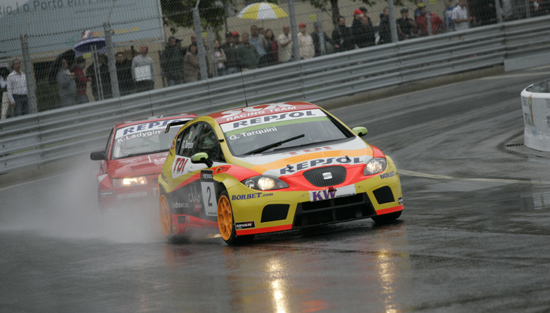 A move to SEAT for the first full season of the Leon came about for 2006, with Tarquini improving to fifth in the championship but only taking one win, again in Turkey. A year and another win, at Zandvoort, on and Tarquini slipped back to eighth in the standings, perhaps signalling a decline in his formidable touring car skills. Instead the Italian turned in his strongest WTCC season to date, ending up second to teammate Yvan Muller at the seasons end, though equalling him with three wins. 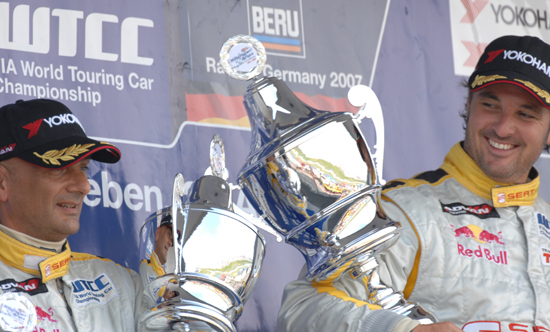 2009 saw another three wins in the WTCC, at Curtiba, Porto and Imola, and another title showdown with Muller, though this time the Italian held the, narrow, advantage. Despite both he and Muller testing the resources of SEAT in Macau a fifth placed finish in race two was enough to secure the World title by four points thanks to a change of approach where Tarquini sought to eradicate the pointless finishes that had blighted previous campaigns. 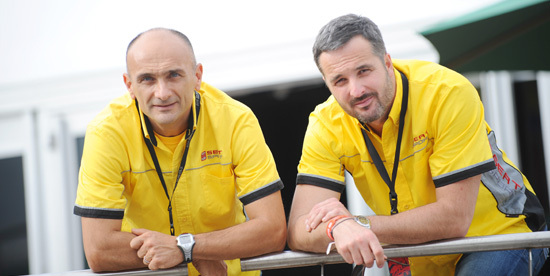 “Experience is a crucial factor to survive touring car tough racing”, says Tarquini, “So the age is not so important. And I still feel young enough to be competitive. The title though confirms, if it indeed needing any confirming, that Tarquini too is a great driver and deserves to be discussed as such in the same breath as people like Laurent Aiello, Alain Menu and Bernd Schneider. 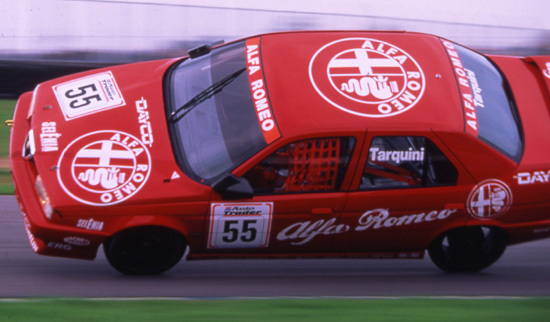 That Tarquini perhaps isn’t thought of as such can be put down to a variety of reasons, from being the victim of being shunted around from series-to-series by Alfa to a perception that his BTCC title came as much from having the best equipment as superb speed and racecraft. The longevity of his career as a works driver and the sheer number of wins across eight major touring car series suggest otherwise, and with Tarquini stating he has no intention of stopping anytime soon the Italian should be adding to his tally of wins for some time to come.